You can make your own Thai peanut sauce, as indicated in the recipe, or substitute with a store-bought jar of your favorite Thai sauce. Enjoy! In a large skillet, brown the ground turkey with minced onion and garlic powder. Drain and return to the skillet. In a large mixing bowl, whisk together the rice vinegar, soy sauce, lime juice and peanut butter with a few pinches of salt and pepper. Pour over the browned ground turkey and let simmer for 4 to 5 minutes. Assemble lettuce cups with turkey and sauce and shredded cabbage in each lettuce leaf. Garnish with chopped cilantro. 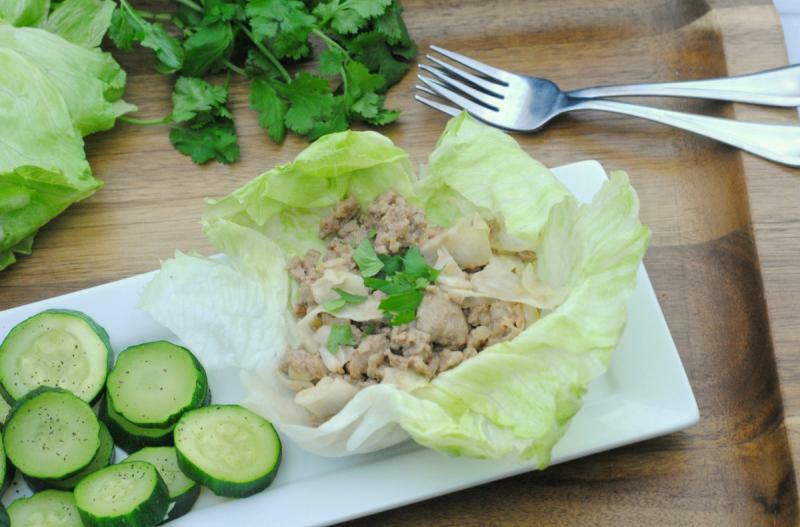 Serve Thai Turkey Lettuce Cups with veggies. Brown 2 lbs. ground turkey with 2 Tbsp minced onion and 2 tsp garlic powder. Drain if needed, and let cool. In a large mixing bowl, whisk together the 6 Tbsp rice vinegar, 6 Tbsp soy sauce, 4 Tbsp lime juice and 4 Tbsp peanut butter with a few pinches of salt and pepper. Recipe is gluten-free when you use gluten-free soy sauce or coconut aminos. Thaw chicken in the marinade and transfer to skillet and brown the chicken pieces. Serve in lettuce wraps with shredded cabbage and cilantro garnish.